When Holmes Landscape Company begins work on a new customer’s neighborhood, certain audits, tests, and corrective actions are performed. This summarizes our “new customer” process which is above and beyond the weekly landscape maintenance work we begin immediately. Completing a neighborhood walk-through and doing a comprehensive site analysis are things we actually do prior to preparing to bid on a new job. The site analysis gives us the information we need to accurately define the type and amount of work a neighborhood will require to bring it up to Holmes Landscape Company’s high standard. When we start or take over a job, the first thing we do is a complete irrigation audit because we believe it is essential that we insure the landscape is being properly watered. Both over watering and under watering is harmful to the landscape, so we check every station on every controller, measuring its individual flow rate, and we check the area that each valve waters. All repairs and corrections are made immediately, and all systems are checked for correct nozzles, head placement, water pressure, and over spray. Once all the field work has been completed, the information gathered is entered into our computerized irrigation management and monitoring system (designed by Larry Holmes). This system helps us control the amount of water applied based on the existing weather. The next step is to spruce up the neighborhood. We normally clean around the residences first, then any common areas, and finally any slope areas. This process can sometimes take a fair amount of time to accomplish depending on how neglected the landscape is and how large the neighborhood. With the general cleanup work in progress, we usually take more soil samples and do soil tests throughout the neighborhood to establish the quality and type of existing soils. Based on the nutrient deficiencies identified in our site analysis and soil testing, we establish and implement our fertilization program for the planters, lawns and slope areas. Based on problems identified in our site analysis, we establish and implement our weed and pest control program for the problem areas. Based on all the information gathered, we establish and implement our lawn care program for the neighborhood. Depending on the time of year, that may call for us to initiate a semi-annual aeration and a deeper watering schedule to encourage root growth and deeper penetration (spring and early summer), or it may call for us to initiate a reduced watering schedule (late fall and winter). One of the last things we do for a new customer is corrective pruning and shaping of the landscape plants and trees. The goal here is to accent the individual plant or tree’s form, or to restore its form to what it should be. Finally, we schedule nursery trips with the customer’s landscape committee and board members to educate them on the plant material that is best suited for their neighborhood, and to put the final touches on a site-specific plant list. With that list and with information obtained through our site analysis, we meet with these customer representatives to establish short and long term goals for the neighborhood – goals that will determine when and where landscape improvements will be made. 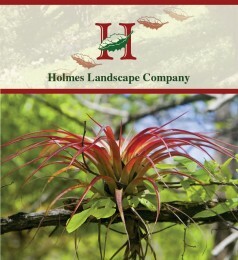 When this process is followed, the neighborhood is well on its way to becoming a Holmes Landscape Company neighborhood. And, when this process is completed, the neighborhood is in a condition that allows the upgrades and renovation work defined by the goals to begin.